The Stalwart was designed in 1959 and put in action in the mid-1960s. It is a reliable workhorse that was designed to cross rough English countryside terrain at a maximum 40 mph or traverse a water obstacle at around 6 knots. The Stalwart has a 240 bhp dry sump engine with twin plate clutch, all wheel drive, twin circuit brakes with dual servos, disc brakes all round, alloy wheels with 14" wide tires, central driving position, hand built, limited rearward visibility. 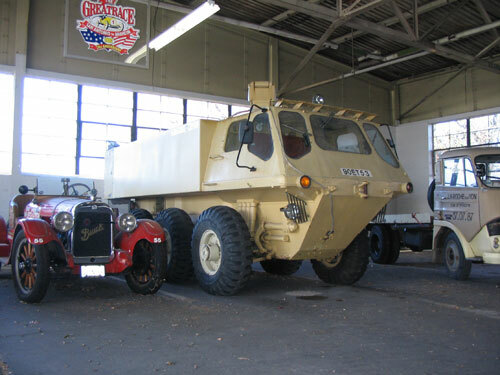 It is a highly specialized off-roader that was never designed to run on asphalt. It has only one differential (left and right). That means that the three wheels on each side rotate at the same revolutions. Advancement in helicopter design and the military’s change to an all diesel fleet put an end to the life span of this workhorse.